Making slipcovers for your dining room chairs is so easy. It takes a bit of fussing, but no sewing, and the results are elegant. 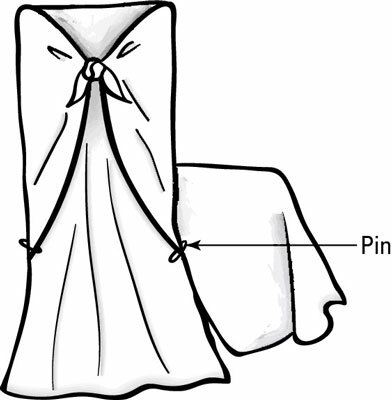 All you have to do is wrap, drape, tie, pin, and arrange the fabric so it’s perfect to your eye. Watch out — this treatment is so easy you may find yourself making new slipcovers just because your mother-in-law is coming for dinner on a Friday night (well, maybe not . . . ). Most dining room chairs are generally the same size, give or take a few inches. For this project, the chair was 44 inches high x 20 inches wide x about 22 inches deep. You need about 3 yards of 45-inch-wide fabric to cover one standard-size dining room chair. If you have an oversize dining table and chair set and your dining room chair is wider, you may consider using 60-inch-wide fabric to guarantee adequate coverage. To measure your dining room chair, start with the length. From the back of your chair, measure up and over the seat back, across the cushion and front and down to the floor in front. For the width, measure the entire chair from left side to right, starting on the floor on one side and going over the seat down to the floor on the other side. If you choose wisely, one neutral style of fabric can give you plenty of use, because it can assume many attitudes as you add contrasting, interchangeable ropes, ribbons, twines, and other trims to alter your slipcover’s appearance. Unless you’re a good fabric cutter, when you’re fabric shopping for four chairs, be sure to add an extra half-yard or yard of fabric for each chair, in case you make a mistake. You can always use the extra for some pretty coordinating napkins or placemats. Iron all your fabric well, so that it easily drapes over the chair. 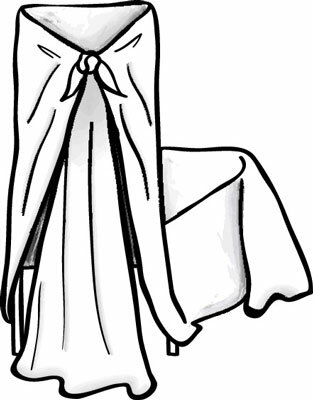 Starting at the floor in front of the chair and ending at the floor in the back of the chair, evenly drape the fabric over the chair. 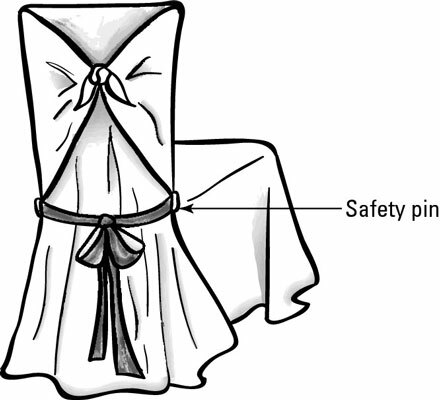 Working from behind the chair, take the edges of the fabric that are near the top of the back of the chair and tie them in a knot. Pull the edges of the fabric that hang underneath the knot toward the base of the chair (where the back meets the seat), and pin them into place to create a wall of fabric across the outside chair back. Add the decorative ribbon if and where you want. If you have an open-back chair, you can cut two 1-inch holes in the fabric at the inside back of the chair base (near the chair’s solid, back support area), thread 1-inch-wide ribbons through the holes, and tie them in two bows. Be sure to wind the ribbon through the safety pin to add support. Each bow uses 1-1/2 yards of ribbon. 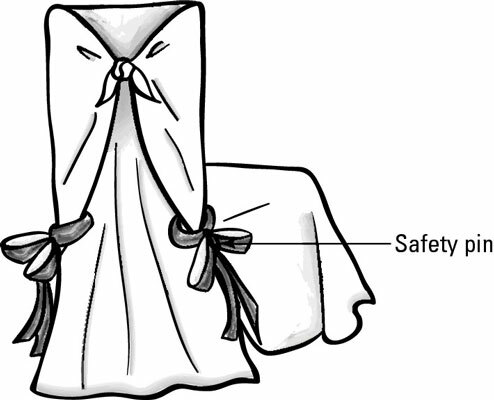 The securely tied bow helps keep the fabric in place. If your chair doesn’t have an open back, consider tying a ribbon around the entire chair at the base (where the back meets the seat). Be sure your ribbon goes through the safety pins.